Showing 35 articles from November 30, 2016. LOUISBURG -- The Franklin County Board of Education last week unanimously rejected three changes in upcoming construction projects that had been ordered by the county commissioners a few days earlier, setting the stage for a confrontation between the two elected boards later that evening. The school board unanimously decided to stay with the construction projects it had carefully planned over the last several weeks. That decision came about two hours before the county commissioners were to meet. LOUISBURG -- The Louisburg Town Council took a significant step toward enticing new residential development in town during its Nov. 21 meeting, agreeing to give back some property tax revenue in the short term to create additional homes. The council, which has been seeking ways to increase residential development for the past several months, unanimously approved an agreement with R&R Construction of Louisburg to encourage the company to build 10 single family houses over the next five years. Santa Claus, brightly colored holiday decorations and, soon, parades, can mean only one thing, Christmas is just around the corner. 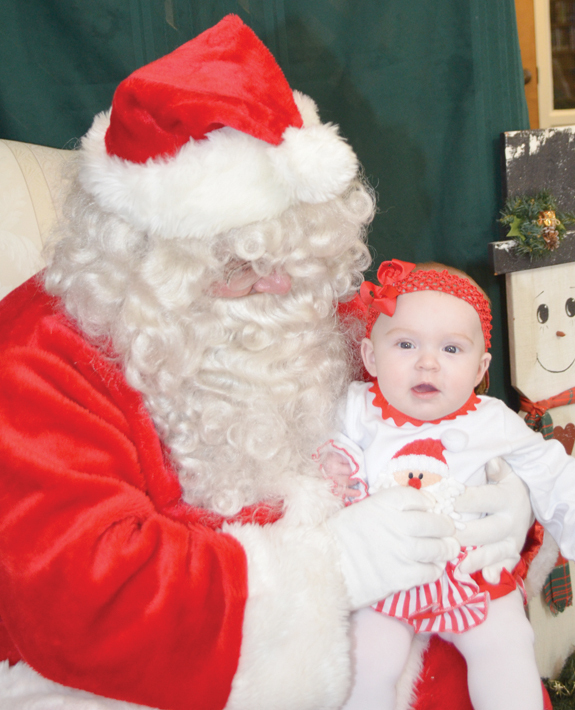 In the photo above, six-month-old Ellie Hope Young, daughter of Chip and Brittany Young, isn't too sure what to make of the Jolly Old Gent from the North Pole whom she encountered at the annual bazaar at the Louisburg United Methodist Church recently. RALEIGH -- A federal court has ordered the state to redraw House and Senate Districts for an election next year. The Nov. 29 decision directly calls for the state to redraw House District 7 covering Franklin County and redrawn maps, experts have said, would most likely impact other districts not directly named in the judges' order. The order, issued by a three- judge panel of the U.S. District Court for the Middle District of North Carolina, imposes a March 15 deadline for the state to draw new districts. 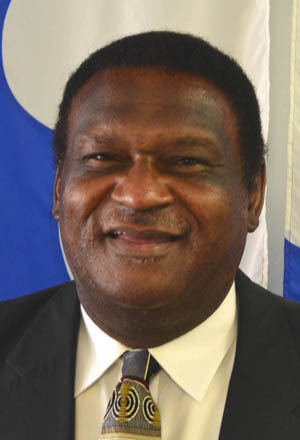 LOUISBURG -- Two new county commissioners will be sworn in during the board's December meeting. 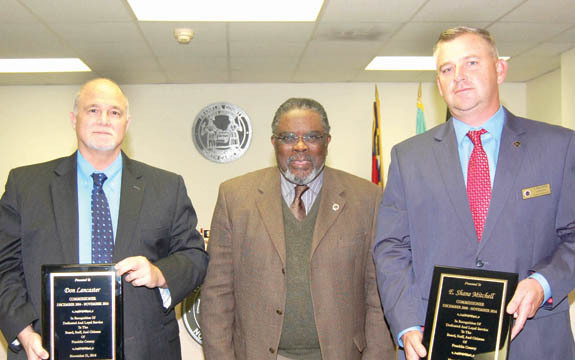 The board's Nov. 21 meeting, though, served as the swan song for Commissioners Don Lancaster and Shane Mitchell. Lancaster has served on the board since 2004 and Mitchell joined the board in 2008. Both opted not to seek re-election in District 5 and District 7, respectively. Who decides what school building priorities should be? You could see it brewing for several months, but what we have now is a potentially full-fledged confrontation between the school board and county commissioners. But there is much more to the story than what meets the eye -- and since it affects public education in our county, it is important. In a nutshell, the school board spent months evaluating its needs and ways to meet as many of those prioritized needs as possible with the remaining $11.3 million in bond issue money it should have available. 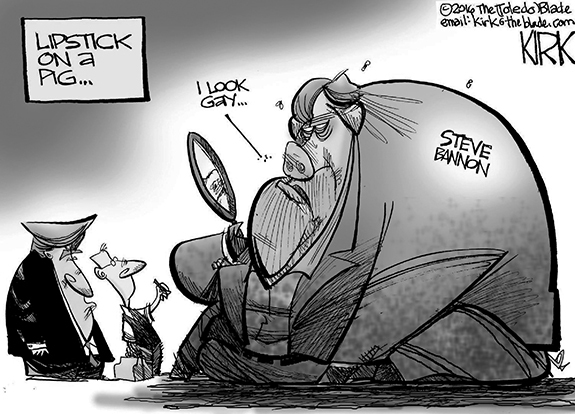 Those are three of the legs on which the "stool" of our democracy rests -- and all three of them are under attack from some very unlikely sources. The core of our system of government is that American citizens have trust and confidence in our government -- and that it remains credible. 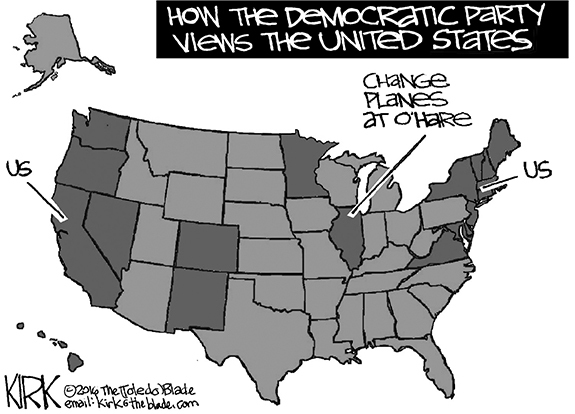 Why else would Americans send off their precious young men and women to fight -- and die -- in wars and why else would Americans be willing to send a significant portion of their income every year to keep the wheels of government running smoothly? In 1999, I lived in New Bern and I remember when Hurricane Floyd came through. More specifically, I remember the day after Hurricane Floyd as a photographer and I walked and rode the streets of Craven County, looking to chronicle the impact of the storm. We looked in all of the usual places, but we couldn't find anything more than the usual remnants of a heavy rain -- some puddles here and there, but nothing more. 'Hail Mary plan aimed at getting McCrory a job? By all normal standards and in the opinion of all neutral observers, Roy Cooper defeated Pat McCrory and is the Governor-elect of North Carolina. 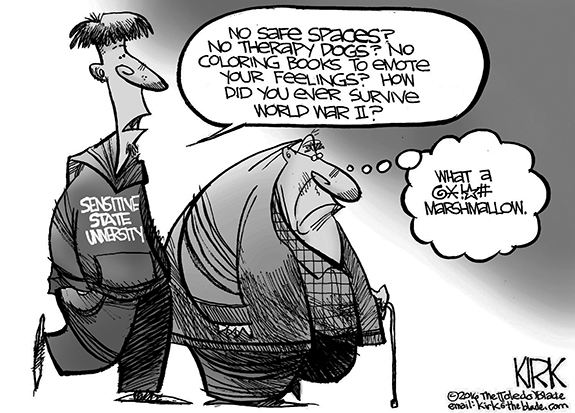 As of this writing, McCrory is unwilling to accept reality and continues to make North Carolina the punch line of jokes. There is a Hail Mary play in his game plan and only a public outcry can stop it. McCrory and his minions are claiming voter fraud. FRANKLINTON - James Franklin Burchette, 78, died Friday, Nov. 25, 2016 at his home. The family will receive friends Saturday, Dec. 3, at 1:15 p.m. at Unity Baptist Church in Franklinton, where a memorial service will follow at 2 p.m., with the Rev. Bradley Johnson and the Rev. David Averette officiating. SEASON TO REMEMBER. Senior Quamon Person nearly rushed for 2,000 yards this season for the Louisburg HS Warriors, who advanced to the Class 1-A State Football Playoffs. 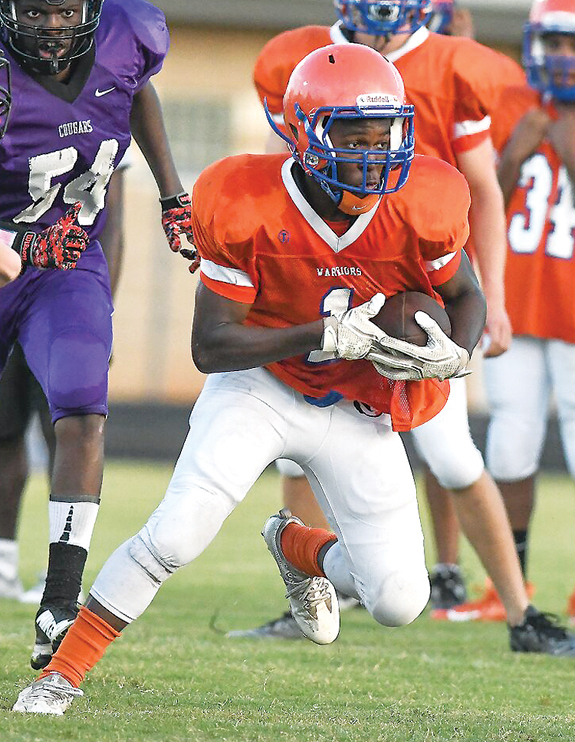 LOUISBURG -- When Quamon Person arrived at Louisburg High School four seasons ago, it was almost a given that he would develop into an excellent all-around athlete for the Warriors. After all, Person comes from an athletic family, and it was expected that he would continue the tradition. But while Person has been solid in basketball and baseball for Louisburg, his real potential was thought to be on the gridiron. ROLLING OUT. Bunn High School veteran quarterback Quenten Wright looks for a receiver during the Wildcats' home game last Friday night against Northside-Jacksonville in the Class 2-AA State Playoffs. BUNN - Bunn had hoped for a climactic ending to David Howle's glorious 25-year career as the school's head football coach -- but it wasn't meant to be. Instead, the Wildcats were edged 15-7 by Northside-Jacksonville last Friday at home in the second round of the Class 2-AA State Playoffs in a defensive-minded contest. Bunn capped its campaign at 11-2, and it will be the final season for Howle, who has already announced his retirement. 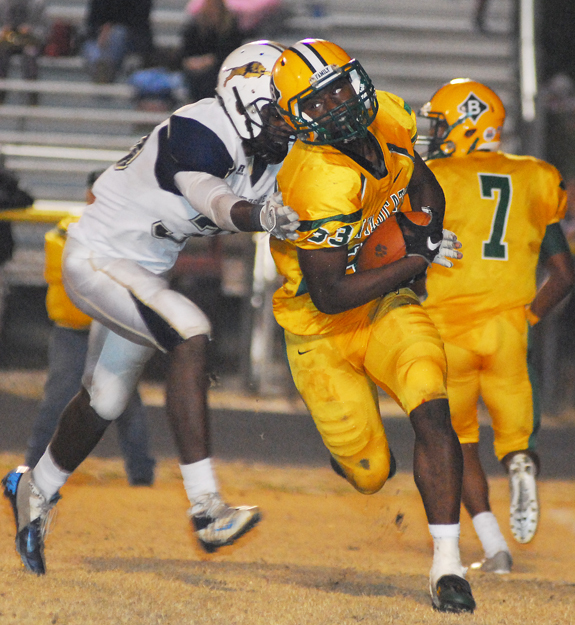 Northside, now 10-3, advances into a third-round matchup this Friday on the road against powerhouse Clinton. FRANKLIN COUNTY -- Another year, another strong showing by the Northern Carolina Conference in volleyball. 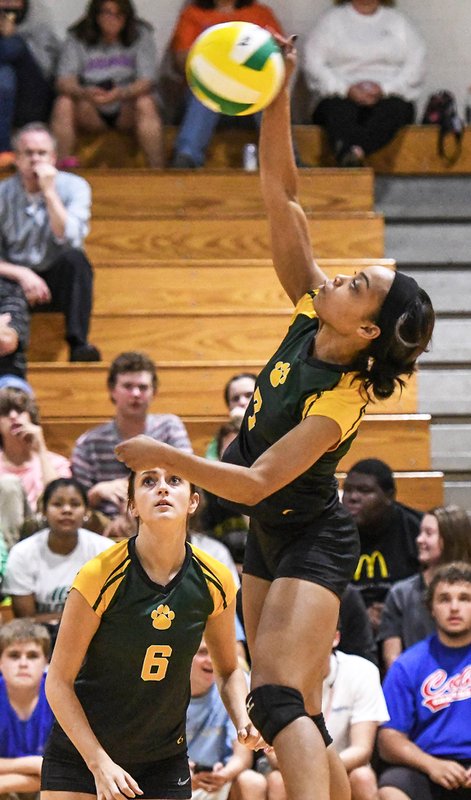 The NCC has developed a solid spike trend in recent seasons -- a trend that should continue when the likes of Louisburg and Oxford Webb join the league in 2017 due to the latest realignment by the North Carolina High School Athletic Association. The current configuration of the NCC came to a close with South Granville winning the regular season and tournament championships. 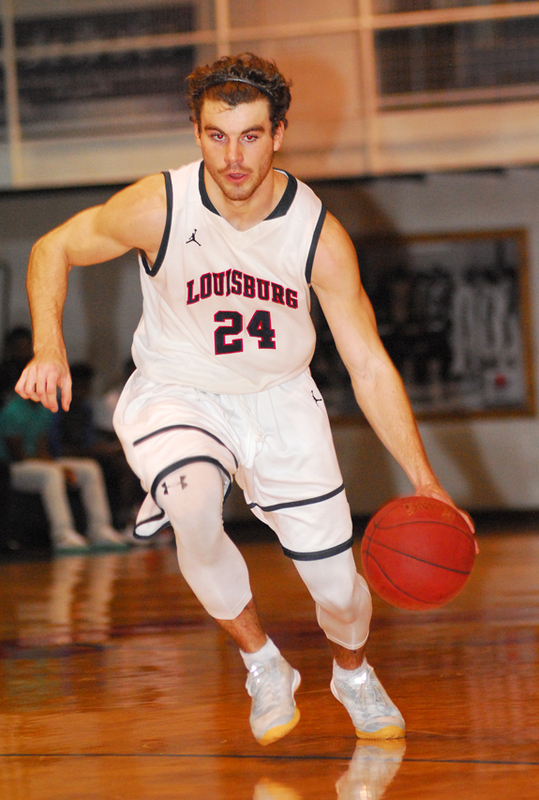 LOUISBURG -- Louisburg College's men's basketball team upped its record to 5-2 last Monday with a 111-82 home decision against Alamance Community College at Taylor Center on the LC campus. LC led 52-41 at the break before pulling away during the second half of action. Six players hit double figures for the Hurricanes, led by Jordan Oakley off the bench with 22 points to go with eight rebounds. BUNN -- Bunn will host its annual Holiday Basketball Tournament from December 27-29 -- but with a twist this time around. This year's event will be boys only and will feature eight teams, as opposed to four from the previous tourneys. In addition to the host Wildcats, other entrants will be Wake Forest, Northern Nash, North Pitt, Durham School of Arts, Eastern Wayne, Wakefield and Southern Nash. FRANKLIN COUNTY -- The Combat Warriors Deer Hunt was held in early November in Franklin County. This deer-hunting event had 17 soldiers and veterans to come for the weekend of November 4-6. They stayed at Mrs. Mavis Nelms' cabin near Louisburg. This was the Combat Warriors sixth consecutive annual deer hunting event in Franklin County. CHAPEL HILL -- The North Carolina High School Athletic Association has announced its game times and sites for the state football championship games. 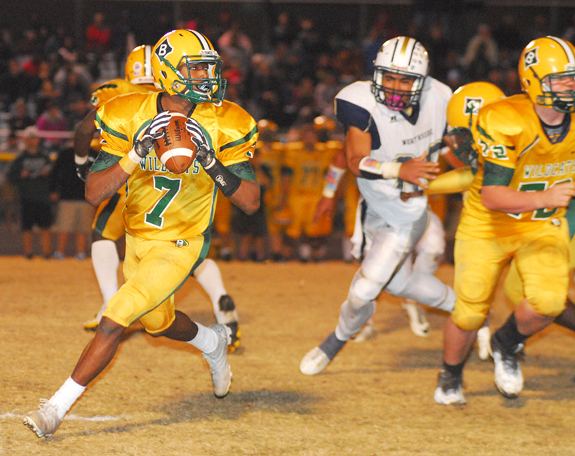 Celik Curtis (with ball) was strong on both sides of the ball last Friday for the Bunn Wildcats during their Class 2-A State Playoff game at home. 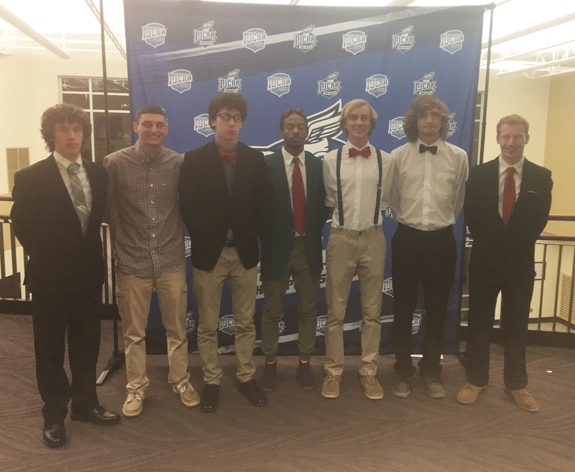 Members of the Louisburg College men's cross country team pose at the annual pre-event banquet at the National Junior College Athletic Association National Championships. The event was held this year in El Dorado, Kansas. The Hurricanes, under the direction of head coach Jay Koloseus, finished in 11th place in the men's team standings at the prestigious distance-running showcase. 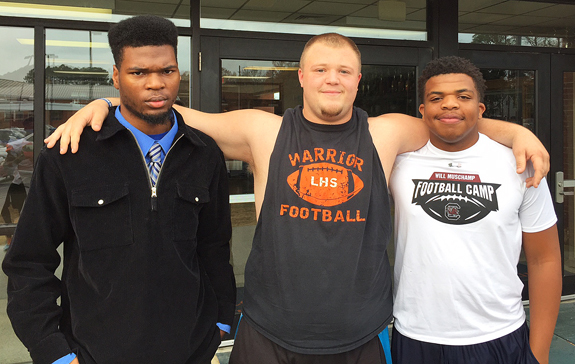 Among the contributors to Louisburg High Schools tri-championship season in the Tar-Roanoke Athletic Conference were (l to r) Octavius Scoggins, Noah Allen and Devin McGirt. The Warriors bounced back from a 1-10 worksheet in 2015 to enjoy a successful campaign this fall under Coach Dontae Lassiter. 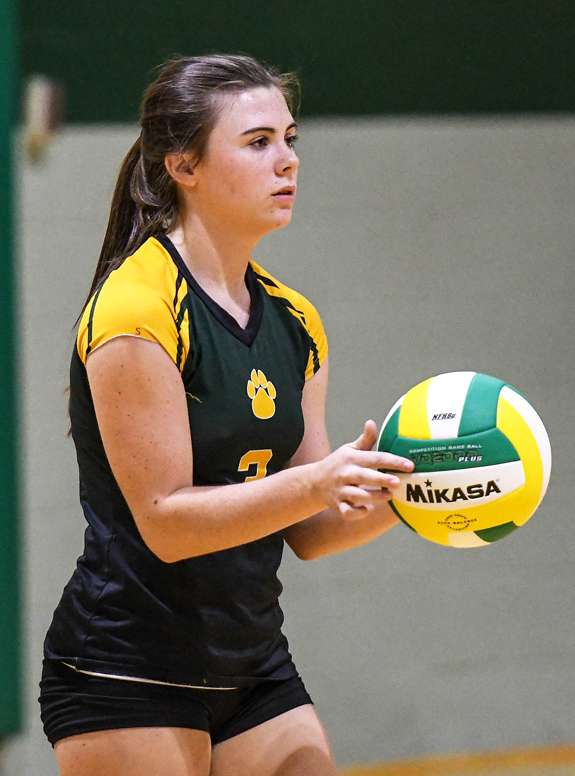 Senior veteran Alexis McPhail was exceptional this season for the Bunn High School volleyball squad, which reached the second round of the NCHSAA Class 2-A State Playoffs. 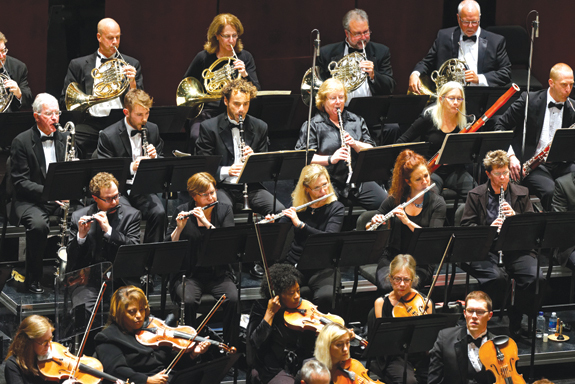 The Greensboro Symphony Orchestra will bring its Holiday Pops show to Louisburg College at 7:30 p.m. Saturday, Dec. 10. This orchestra is one of the largest professional arts organizations in the state, and will be performing holiday favorites such as "Sleigh Ride" and "White Christmas." In addition to the concert, there will be a tree lighting at 7 p.m. in the Holt Lobby to kick off the holiday season. Unwrapped gifts will be accepted to give to local children in need throughout Franklin County. Free holiday refreshments will be served at intermission. Photographer, Tammy Winkel will be Franklin County Arts Council's featured artist for December. Her show will premier Dec. 10 from 3 to 5 p.m. with an afternoon tea in the Back Gallery at FCAC Headquarters, 22 S. Main Street, in downtown Franklinton. 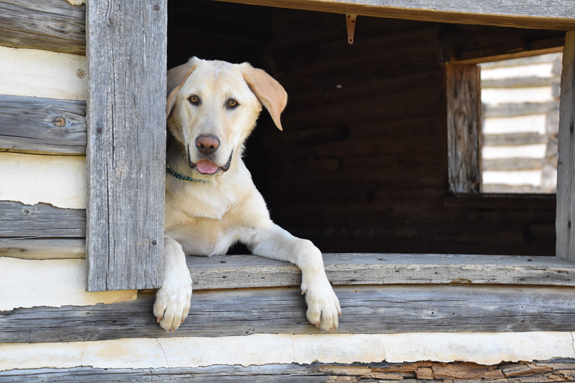 Winkel will give a short talk and answer questions on her work as a photographer specializing in pet and animal portraits. The public is invited for this family-friendly, free event. Auditions are being held today and again on Dec. 4 at 2 to 5 p.m. each day for all roles in the Shakespearean classic A Midsummer Night's Dream. Norris Theatre Director Wally Hurst will direct the production, which will be presented from Feb. 9 through Feb. 18. All roles are open. "We are excited to be bringing Shakespeare back to Louisburg College," Hurst said in announcing the auditions. "I look forward to seeing this show take shape in this incredible playing space." 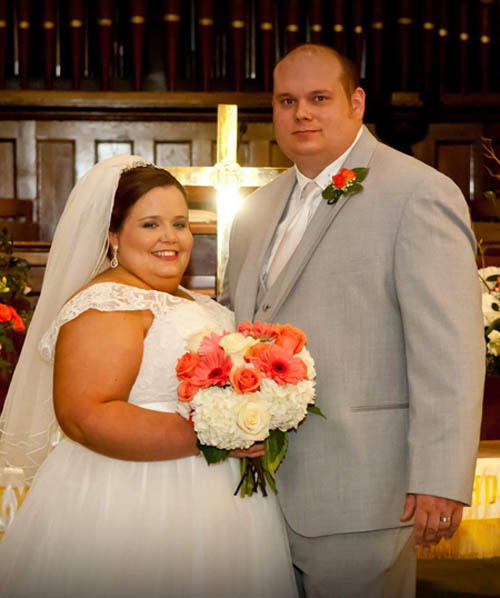 Caroline Victoria Bethea and Christopher Neal Murphy were married on Sept. 24, 2016 at Louisburg United Methodist Church in Louisburg, with the Rev. Michael Safley officiating. The bride is the daughter of Victor and Meloni Bethea of Louisburg. The groom is son of Lori Neal Murphy of Castalia and the late Clyde Murphy Jr. He is the grandson of Clyde and Faye Murphy. The board of advisors of the Franklin County Community Foundation has announced the availability of small grants to teachers in Franklin County from its Education Fund. The mini-grants program was established to encourage creativity in effective teaching throughout the Franklin County School System. LOUISBURG -- The State Highway Patrol said a Raleigh woman was negligent in a Thanksgiving day wreck that killed a two-year-old girl. According to a report by Trooper C.M. Garner, Carolyn Casey Sharp, 26, was driving a 1998 Honda east along N.C. 561 when she crossed the center line and ran off the left side of the road. The car struck a culvert, went airborne and began to overturn, striking two pine trees. LOUISBURG -- Insurance agents and deputies with the Franklin County sheriff's office arrested a woman on charges of insurance fraud recently. Deborah L. Dew, 45, of Twin Creek Drive, was charged with felony insurance fraud, felony conspiracy, felony obtaining property by false pretense, and misdemeanor false report to a police station. Insurance and sheriff's office investigators allege Dew filed a claim to receive an insurance payment in an automobile accident that she staged. FINDING FUN. Joy McLeod (left) and Annie Best made cleaning up giant pots seem like fun. Food, fellowship, fun and Thanksgiving! In what has become a Thanksgiving holiday tradition, Blessings, Inc, held its free holiday dinner last Thursday at Louisburg College. 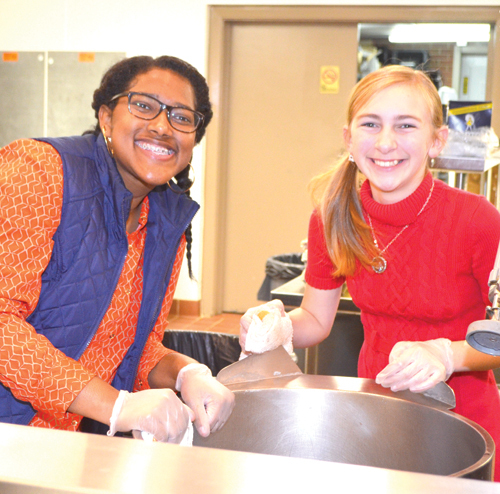 Although clearly food was the focus, the dinner is also about fellowship as people who may not see each other often during the year join forces and talents to prepare and serve a spread that would make top-notch restaurants proud. This year's event drew an excellent crowd, even though it started slowly under threatening skies and a bit of a drizzle. HENDERSON -- The Franklin-Granville-Vance Partnership for Children has tabbed a Vance County man for its top leadership post. FGV Smart Start Inc. announced that Dr. Tony Cozart will lead the organization, which designs and provides programs and services for families and children in Franklin, Granville, and Vance counties. 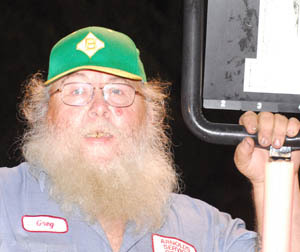 Cozart is a retired educator with over 32 years in the local public school systems. 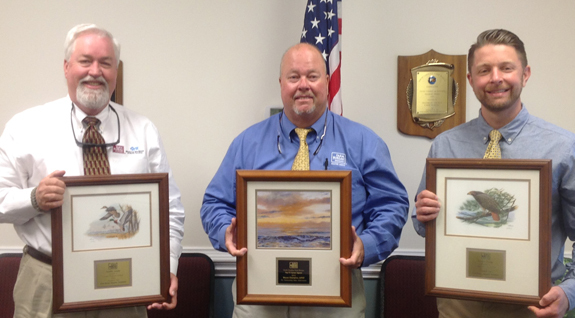 Wayne Champion (center) and Nat Sandling (left), agents in the local Farm Bureau Insurance office, were recently awarded the NAIFA Quality Award for their outstanding sales in life and annuities by the National Association of Insurance and Financial Advisors. Chris Slack (right), an agent at the same location, was awarded the NAIFA Multiline Sales Award, for achieving superior sales in both life, annuities and property and casualty policies.